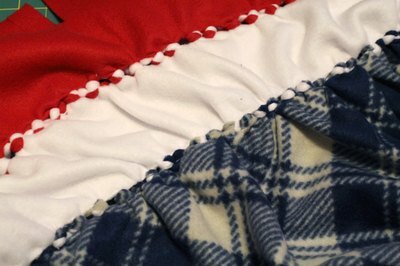 A no-sew fleece blanket is an easy project for crafters at any skill level -- no sewing experience (or even electricity) is needed. The fringe and knots create wonderful texture, and the blanket can be completely customized according to size, color and pattern. 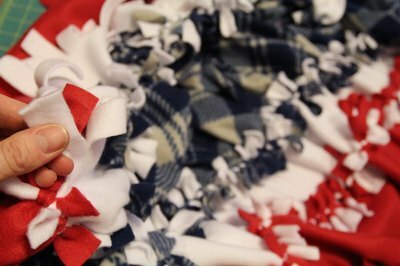 You'll be amazed at how just a few remnants of fleece can come together as a statement-making blanket. Note: To prevent shrinkage, begin by washing and drying your fleece before using it. 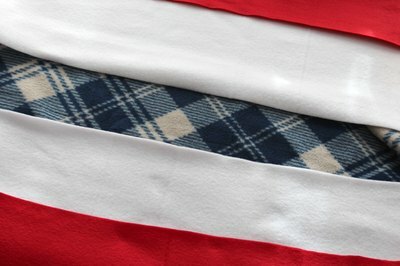 The amount of fleece needed to make the baby-size blanket in this tutorial is 1/2 yard of blue plaid fleece, 1/2 yard of white fleece and 1/2 yard of red fleece. If you'd like to make a larger blanket, a yard of each fleece color will double the blanket size. Fold a 1/2-yard piece of fleece in half, selvage ends together. Selvage ends are the finished edges of fabric that prevent it from unraveling or fraying. 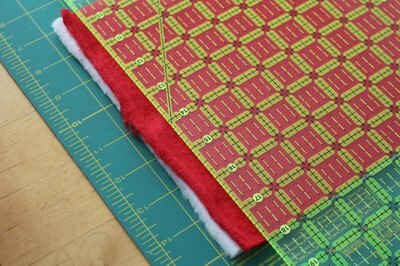 Use the rotary cutter, cutting mat and clear ruler to trim one panel of the fleece so that it is 8 1/2 inches wide. (The length will be 58 inches if you purchased your fleece off the bolt.) Use scissors if you do not have a rotary cutter. Tip: Mark your fleece with tailor's chalk before cutting to help guide you and to ensure straight lines. 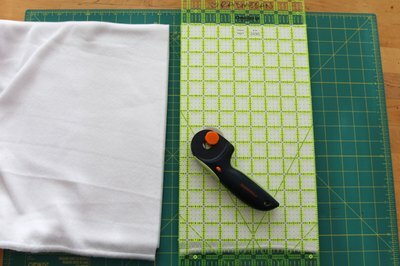 Use a large surface like a table or floor while cutting. You could also pin the fleece down to ensure straight lines. 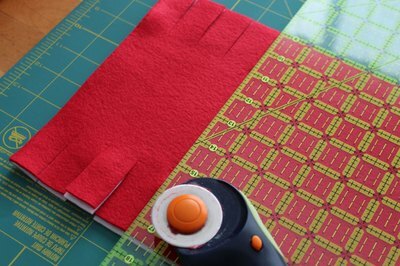 Cut a matching 8 1/2-by-58-inch panel of fleece in the same color as in the previous step. Then, measure and cut two more 8 1/2-by-58-inch panels in a second color of fleece. 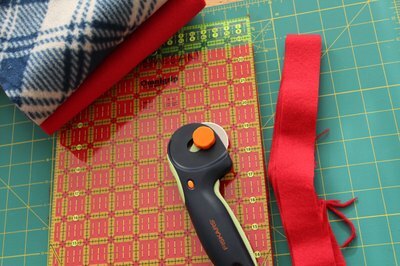 Using a third color/pattern of fleece, measure and cut one 17-by-58-inch panel to serve as the widest panel in your blanket. 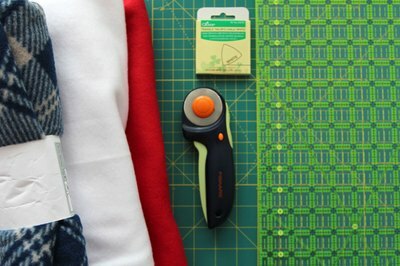 Use the ruler to help guide you in cutting off the selvages in a clean, straight line. Remove the selvages from all of the fleece panels. When all of your panels are ready, arrange them on a flat surface to ensure you like the pattern before you begin cutting and knotting. 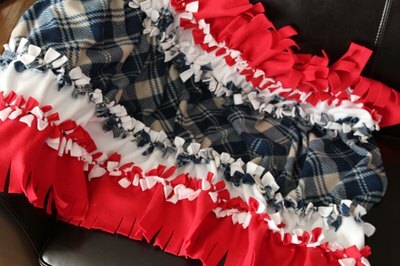 The blanket featured in this project uses two 8 1/2-inch wide red panels on the outermost ends, one 17-inch wide blue plaid panel in the center position, and two 8 1/2-inch wide white panels between the red and blue panels. Tip: These five panels will make a baby-size blanket. If you'd like to make a bigger blanket, simply cut more fleece panels. Add as many panels as you'd like to extend the length of the blanket. 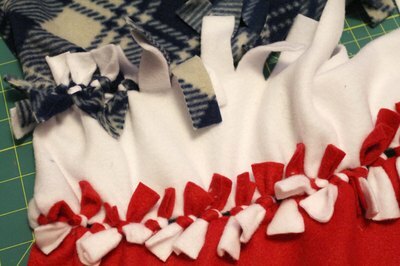 Select two colors that will be side by side in your blanket, in this case, red and white. Set the two panels of fleece on top of each other, wrong sides together. 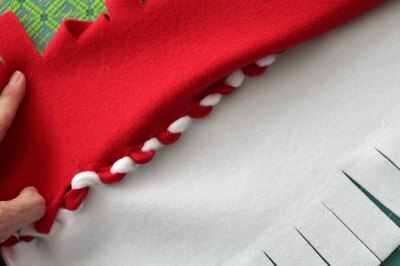 Using your clear ruler, cutting mat and rotary blade, cut fringe on both of the long sides of the fleece panels. The fringes should measure 2.5 inches long and be spaced 1 inch apart. Repeat on the second set of red and white fleece panels and set them aside. Tip: Fringe that is any shorter than 2.5 inches long will be difficult to knot. Also, if you decide to cut longer fringe, you will be losing real estate on your blanket. 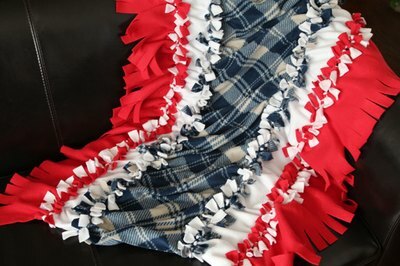 When the two panels of fleece are completely fringed, begin tightly knotting the corresponding pieces of fringe together, one red and one white piece, with a secure double knot. As you continue to double knot the corresponding fringe pieces, periodically flip your panels over to ensure that no lone piece of fringe was overlooked. The backside of the panels shouldn't have any fringe pieces peeking through. After you're done knotting the two panels together, repeat on the remaining red and white panels. 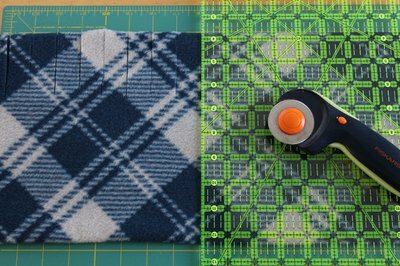 When your first two sets of panels are completely knotted together, grab your widest panel of fleece (in this case, blue plaid) and fold it in half with the long sides together. 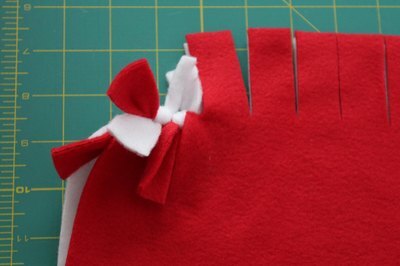 Measure and cut 2 1/2-by-1-inch pieces of fringe along the cut side of the panel, but do not cut fringe into the folded side of this panel. Unfold the widest panel of fleece and set it between the first two sets of knotted panels. Place all of the right sides of the fleece panels facing up. If you prefer to knot the fringe pieces with the panels folded away from each other, then place all of the wrong sides facing up. Begin knotting the center panel to one of the side panels. If you keep checking your work as you knot, you should avoid the extremely disheartening disappointment of finding a lone piece of fringe. If you do, however, find a rogue fringe and cannot (or choose not to) untie your fringe knots, just knot the lone fringe to the last complete pair you had and double-check that there are no gaping holes in your blanket panels. Continue knotting the center panel to the remaining side panel until your blanket is complete. Cozy up in your multi-colored, quick-to-make, no-sew fleece blanket, or give it as a gift. Wash with cool water and tumble or line dry for best results.